It's been a long time since I made this herbal tea jelly and after those roasts and delicious cholesterol loaded food the last few days, it was about time to make some cooling tea. As the weather is so very hot and humid, this would be ideal for WB and myself . 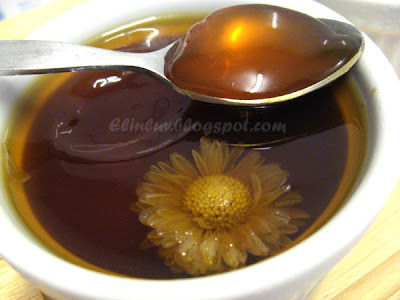 I simmered some dried yellow chrysanthemum flowers with ginseng roots and turned them into wobbly jellies. Huh..I love wobbly jellies :) scoop the wobbly refreshing jelly into the mouth and let it slide on the tongue....slowly taking in the refreshing herbal tea fragrance....mmmmmm this is heavenly after almost being roasted in the scorching hot weather ! 1. Boil 2500 ml water in a pot on medium heat, when the water boils, add in the dried chrysanthemum flowers, ginseng roots and cane sugar and boils for another ½ hr . 2. Sieved out the flowers . 3. 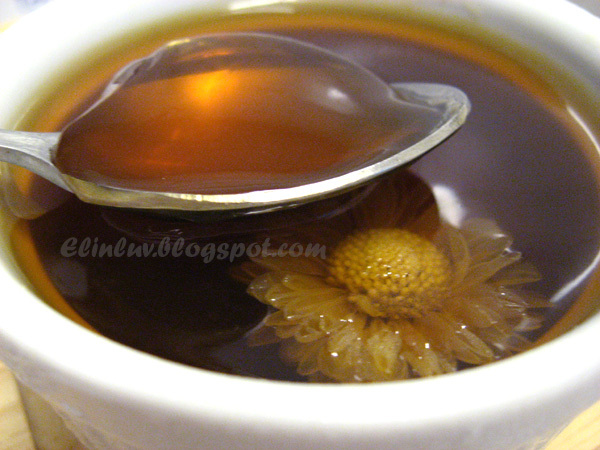 Dissolve the agar agar powder with 3 tbsp of water and add to the chrysanthemum tea. Boil over low heat until the agar agar powder has totally dissolved. 4. Pour into ramekins and decorate with a piece of chrysanthemum flower each . When it is cool, put into the fridge to set the jellies. It will set in 4 - 5 hours. Note: If you prefer the texture to be harder, add a bit more of the agar agar powder. Nice to read this post.Herbal tea is very effective to our health.It keeps us healthy and fresh.Herbal tea is the best one.